Introduction and Objectives: Paralleling the increased use of computerised tomography pulmonary angiography (CTPA) in the investigation of pulmonary thromboembolsm (PTE) is anecdotal evidence that there has been an increased subsequent demand particularly on radiology resources as a result of incidental or co-lateral findings. Presently we set out to quantify and investigate the nature of these investigations with an evaluation of return on investment. Methods: All 252 CTPA undertaken over a 12-month period to 31 December 2007 for primary exclusion of PTE were identified. The median age of patients was 69 years (range 18–98) with 148 (59%) women. Supporting data were gathered retrospectively from the hospital PACS radiology reporting system, from e-script electronic result reports and discharge summaries. Results: Although 83/252 (33%) had confirmed PTE on CTPA, from the group as a whole (n = 252), additional diagnoses other than PTE were also reported in 136 (54%) patients and in whom for 91/252 (36%) this was a new and significant finding. Comparatively, more of these additional outcomes were reported in the group with no PTE (103/169 (61%) vs 33/83 (40%), p = 0.002). Analysed together, these additional findings included consolidation (10%), emphysema (9%), primary lung carcinoma (4%), lung metastases (4%), mediastinal lymphadenopathy (4%), pleural thickening (4%), pleural effusions (4%) and lobar/segmental collapse (3%). Follow-up investigations, excluding plain chest radiology, were undertaken in 30/136 (22.1%) of those with reported abnormal CTPA, with further staging or high resolution computerised tomography (CT) (14%), fibreoptic bronchoscopy (9%), chest or abdominal ultrasound (3%) and cardiac echo (2%). Collectively, initial CTPA and subsequent investigations identified eight new diagnoses of primary lung carcinoma, nine of lung metastases, 10 of mediastinal lymphadenopathy and nine pleural effusions. Conclusions: CTPA reports generate concerns about new diagnoses in a significant proportion of patients and the anecdotal evidence regarding added workload seems to be well founded with, in particular, the number of malignancies detected inadvertently. With the increased use of CT services further resources will also have to be matched to maintain and drive standards. The disparity in reporting findings between scans in which PTE is found and not, is not explained here but may be a bias in reporting and requires further evaluation. Background: The British Thoracic Society guidelines for the management of suspected acute pulmonary embolism (PE) recommend that the “current organisation for outpatient management of DVT should be extended to include stable patients with PE”. Five years later, outpatient treatment is not widely accepted, largely because no explicit clinical criteria exist to identify low-risk patients accurately. However, recent studies suggest that the pulmonary embolism severity index (PESI) accurately identifies low-risk patients. Methods: Four hospitals enrolling patients in VERITY (a UK multicentre observational registry aiming to assess and improve venous thromboembolic event outpatient treatment practice) volunteered to participate in this pilot study to assess the potential accuracy of the PESI to predict 3-month mortality. Centres provided completed case report forms after retrospective review of patients’ notes on a total of 176 consecutive PE patients who had been in their care. The diagnosis had been confirmed by objective diagnostic testing. These patients do not represent an outpatient population, although some of these cases were treated as outpatients. Using baseline data, we calculated the PESI risk class for each patient (class I–V) and assigned patients as low risk (risk classes I and II) or high risk (risk classes III–V). We calculated the sensitivity and specificity of the PESI; the accuracy of the index to classify patients was tested by receiver operating characteristic (ROC) curve analysis, plotted as 1 specificity versus sensitivity for 3-month all-cause mortality and the area under the curve (AUC) was estimated using the Wilcoxon non-parametric approach. Results: Overall mortality at 3 months was 4.5% (8/176), and ranged from 0% to 10.8% (7/65) across the four centres. There were no deaths in the low-risk group (0/111); overall mortality was 12.3% (8/65) for high-risk patients. The sensitivity of the PESI was 1 (0.63 to 1 (97.5% one-sided CI)); the specificity was 0.64 (95% CI 0.56 to 0.71). The AUC of the ROC curve was high (0.90; 95% CI 0.83 to 0.96). Conclusions: This pilot study suggests that the PESI accurately identifies PE patients at low risk of death. Prospective assessment will be undertaken by the VERITY registry at centres moving to an outpatient (or short hospital stay) model for PE treatment. Background: The pathogenetic role of platelet activation in pulmonary arterial hypertension (PAH) is not clear. Platelets are activated in PAH and may influence endothelial cell dysfunction. Advanced therapies for PAH, such as prostacyclin, inhibit platelet function. However, the effect of endothelin 1 (ET-1) and endothelin receptor antagonists on platelet function remains unclear. Aim: To assess the effect of the dual endothelin receptor antagonist, bosentan, on platelet function in normal volunteers (and patients with PAH). Methods: In vitro platelet aggregation was performed on 10 normal volunteers. Lumi-aggregation was used with collagen (2 μg/ml) as the agonist, before and after bosentan (1 μmol final concentration) spiking. In vivo platelet aggregation with collagen (2 μg/ml) has been tested, to date, on seven PAH patients. Venesection prior to commencing bosentan, 4 h after administration and one month after chronic dosing was performed. Results: Impedance aggregation in the healthy volunteers was 17.38 ± 5.3 ohms at baseline, and was significantly lower at 3.75 ± 4.4 ohms following bosentan spiking (p⩽0.001). In the seven PAH patients studied (idiopathic PAH, n = 1; Eisenmenger complex, n = 2; chronic thromboembolic disease, n = 4), impedance aggregation with collagen fell non-significantly from baseline at 12.86 ± 10.51 ohms, to 2.8 ± 6.26 ohms at 4 h (n = 5; p = 0.06). At day one, impedance aggregation was significantly lower than baseline (mean 3.43 ± 5.74; n = 7; p = 0.02), but at one month, this difference was non-significant (7.40 ± 10.85; n = 5; p = 0.06). Conclusion: These findings support the concept that bosentan has an antiplatelet aggregatory effect in vitro and in vivo. Larger in vivo studies are necessary to confirm this finding and to study longer-term in vivo antiplatelet effects. Background: In healthy subjects cardiac output and heart rate (HR) increases linearly with exercise intensity, whereas stroke volume (SV) plateaus at approximately 40% of maximal exercise tolerance. This is due to progressive restriction in ventricular diastolic filling at high exercise levels. The aim of this study was to determine the relationship between stroke volume and work rate in patients with pulmonary hypertension (PH). 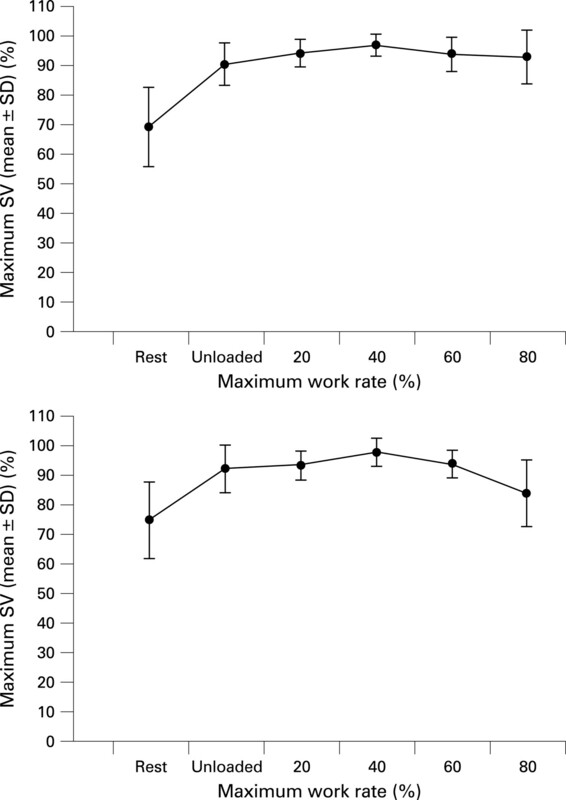 Methods: 10 healthy subjects and eight patients with PH underwent an incremental cycle ergometer cardiopulmonary exercise test to determine the maximum work rate (WRmax) they could achieve. They then underwent a stepwise cardiopulmonary exercise test in which they cycled for 3 minutes unloaded and at 20%, 40%, 60% and 80% WRmax. SV was derived from HR and pulmonary blood flow using the inert gas rebreathing technique (Innocor) at each step during exercise. Results: Patients with PH had lower SV at rest and during exercise than healthy subjects (mean SV index at rest 27.5 ± 6.5 (SD) vs 40.9 ± 9.1 ml m−2, p = 0.001; at 40% WRmax 36.5 ± 9.7 vs 57.3 ± 8.8 ml m−2, p = 0.001). In both healthy and PH subjects, SV represented as a percentage of the subject’s maximum peaked at 40% WRmax (97 ± 3.5% healthy vs 98 ± 4.8% PH). At 80% WRmax, SV maintained peak levels in healthy subjects but fell in PH patients (93.2 ± 9.0% healthy vs 84.1 ± 11.2% PH). Conclusions: SV peaked at 40% WRmax in both healthy subjects and PH patients. This is of interest as it demonstrates that it would be possible to use SV during submaximal exercise as a marker of right heart function in PH patients. In addition, SV declined at exercise intensities greater than 40% WRmax in PH patients but not in healthy subjects. This probably reflects greater dependence on diastolic filling to augment cardiac output response to exercise in PH patients. Introduction: The 6-minute walk test (6MWT) is widely used in patients with pulmonary hypertension (PH). Its role in the clinical and research setting has, however, been questioned. The incremental shuttle walking test (ISWT) is an externally paced field test that has been used in other cardiopulmonary diseases. We hypothesised that the ISWT could provide an alternative exercise field test in PH. Methods: Pulmonary haemodynamics, walk test and cardiopulmonary exercise testing (CPET) results were compared for 20 patients with PH (10 idiopathic pulmonary arterial hypertension (PAH), five chronic thromboembolic pulmonary hypertension, four systemic sclerosis PAH and one portopulmonary PAH). All exercise testing was performed within 3 days of right heart catheterisation. Each test was performed twice, with the greater of the two distances for each test being used in the analysis. To reduce the impact of coexisting respiratory disease on exercise capacity, patients were excluded if their FEV1 or FVC was less than 60% of predicted values. Results: Both walk tests correlated with CPET parameters measured at anaerobic threshold (oxygen consumption vs ISWT r = 0.792; vs 6MWT r = 0.584; work rate vs ISWT r = 0.879; vs 6MWT r = 0.684; ventilatory efficiency vs ISWT r = −0.668; vs 6MWT r = −0.645; ventilatory equivalent for CO2 vs ISWT r = −0.675; vs 6MWT r = −0.653). Peak oxygen consumption, however, only correlated significantly with ISWT (r = 0.55). More modest correlations between mean pulmonary artery pressure (mPAP), cardiac index (CI) and pulmonary vascular resistance (PVR) and ISWT were observed (ISWT vs mPAP, r = −0.495; vs CI, r = 0.447; v PVR, r = −0.538). 6MWT had similar correlations with mPAP (r = −0.448) and PVR (r = −0.538); however, it did not correlate significantly with CI (r = −0.355, p = 0.124). Conclusions: The ISWT correlated at least as strongly as the 6MWT with pulmonary haemodynamics and CPET parameters. Although several variables (eg, oxygen consumption, work rate and CI) did appear to correlate more strongly with ISWT than with the 6MWT, due to small patient numbers no confident conclusions regarding superiority could be made. The findings do, however, support further investigation of the use of the ISWT in the initial and subsequent assessment of patients with PH. Introduction: D-dimer, cardiac troponins and C-reactive protein (CRP) are routinely measured in patients presenting with suspected pulmonary embolism (PE). The aim of this study was to assess whether admission levels of these biomarkers are associated with severity of PE. Methods: A retrospective analysis of 337 acute admissions with confirmed PE on computerised tomography pulmonary angiogram (CTPA). Exclusion criteria were: recurrent thromboembolic disease, thrombophilia or prior anticoagulation; recent surgery; concomitant inflammatory disease and previous evidence of right ventricular/biventricular failure. Admission levels of D-dimer, CRP and troponin I were recorded. The presence of right ventricular strain on CTPA was judged independently by two experienced radiologists. Sensitivity, specificity, positive predictive value (PPV), negative predictive value (NPV) and the area under the receiver operator characteristic curve (AUC) were used to assess the performance of predictive biomarkers. The Kruskal–Wallis test was used for comparison of tests. The outcomes of interest were 30-day mortality and development of right ventricular strain determined by CTPA. Results: 337 patients were included in the study. Overall 30-day mortality was 8.1% and 29% of patients had evidence of right ventricular strain on CTPA. 73.1% of patients had a D-dimer greater than 1000 ng/ml, 20.3% of patients had a troponin greater than 0.02 μg/l and 36.8% of patients had a CRP greater than 100 mg/l. The predictive value of D-dimer, troponin and CRP for these cut-offs is shown in the table. Discussion: Admission D-dimer and troponin levels are predictive of severity in patients presenting with PE. D-dimer less than 1000 ng/ml has a high negative predictive value for PE with accompanying right ventricular strain and 30-day mortality and thus may be useful to identify low-risk patients. A raised troponin may be more useful to identify high-risk patients. CRP has no value in prediction of severity for patients with PE. Further prospective studies are required to establish if troponin or D-dimer can be used to guide risk stratification of patients presenting with PE, either alone, or in combination with clinical prediction scores. Introduction: Suspected pulmonary thromboembolism (PTE) is a common admission to acute medical units (AMU) and that often causes diagnostic uncertainty. The British Thoracic Society (BTS) PTE guidelines recommend a clinical probability score, which includes a subjective element, in the assessment of suspected PTE. However, two predictive rules more commonly recognised are the Wells’ rule, including a subjective element, and the modified Geneva score, which is entirely standardised. Wells’ and Geneva scoring have previously been found to be comparable. The BTS score offers the advantage of simplicity. We assessed the predictive accuracy and the concordance of the three prediction rules: Wells’, modified Geneva and BTS recommended. Methods: We prospectively studied consecutive admissions with suspected PTE, over 12 weeks, to a city teaching hospital without D-dimer availability. Clinical probability was assessed prospectively with the three prediction rules. Results: Eighty patients were included; 60% women. The median age was 53 years (interquartile range 41–69). The overall prevalence of PTE was 10%. The BTS score produced the highest sensitivity (75%; 95% CI 35% to 97%) and negative predictive value (97%; 95% CI 89% to 99%) for PTE with a high probability score. The sensitivity of a high Wells’ (25%) and Geneva (12.5%) score was markedly lower, but failed to reach significance. Receiver operating characteristic curve showed a greater area under the curve (AUC) with the BTS score than Geneva or Wells’ (AUC being 0.84, 0.74 and 0.69, respectively). Concordance between Wells’ and Geneva scoring was moderate (weighted kappa coefficient 0.52). However, poorer concordance was evident between BTS and Geneva or Wells’ (kappa 0.23–0.25). All extreme disagreements in individual patient scores occurred between the BTS and either Wells’ or Geneva. Conclusion: This study suggests that the BTS recommended probability score for suspected PTE may have superior performance compared with the two more complex, yet widely recognised, predictive rules. Confirmation in a larger prospective cohort is recommended. D-dimers were not available within our unit, as is the situation in a number of UK hospitals; however, future comparison should also assess the probability scores in combination with D-dimers.